UPDATED: Fri., Sept. 14, 2018, 10:33 p.m.
Before he became an FCS All-American, Walter Payton Award finalist and the FCS record-holder for single-season passing yards, Eastern Washington quarterback Gage Gubrud was a preferred walk-on who started his career as the Eagles’ kick holder. Now many would argue he’s the best quarterback at the FCS level, and WSU learned two years ago there’s no simple way to stop him. Gubrud doesn’t have the same weapons this time, but the QB is a more polished, experienced version of his 2016 self who’ll take advantage of any defensive miscues the Cougars happen to make. When Gubrud airs it out, there won’t be much of a mystery as to where the ball’s going. The senior QB doesn’t have the luxury of a three-headed monster at wide receiver, like he did with Cooper Kupp, Shaq Hill and Kendrick Bourne in 2016, and one man has been the recipient of 45 percent of Gubrud’s passes through two games. That’s redshirt senior Nsimba Webster, who has 17 catches for 388 yards and four touchdowns this season. By contrast, the next six EWU receivers have totaled 17 catches, 244 receiving yards and two touchdowns. 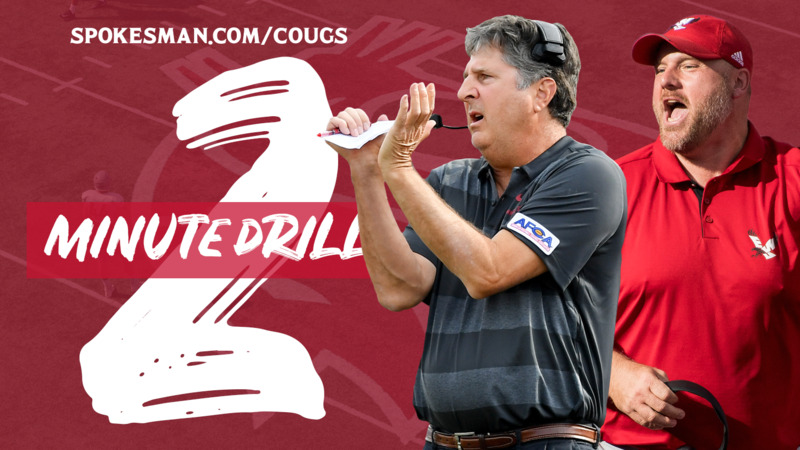 The Cougars have hammered third-down conversions at practice all week, so let’s see if it pays off against an EWU team that’s allowing the opposition to convert just 39 percent on third down. If the Cougars can’t, they can usually rely on fourth down – if they’re in decent field position, that is – and have led the country in that category through two games, converting 7 of 9 fourth downs. The Eagles have given up just one fourth-down conversion this season on just one attempt. This is EWU’s first game versus a Pac-12 team under second-year coach Aaron Best, but the Eagles played eight games against the conference under Beau Baldwin, now the offensive coordinator at Cal, and were competitive more often than not. EWU won twice, against Oregon State (2014) and WSU (2016), and lost six times. Four of those losses, though, came by seven points or less, and the Eagles were only outscored by their Pac-12 competition 352-266 during that span. Published: Sept. 14, 2018, 2:11 p.m. Updated: Sept. 14, 2018, 10:33 p.m.